No trip to the Harry Potter theme park is complete without a visit to Three Broomsticks. This is the signature dining establishment in Hogsmeade and you definitely need to make this part of your tour of the Harry Potter theme park, even if just walking through or grabbing a quick glass of ButterBeer. This quick service restaurant features European delicacies unlike what you will find anywhere else at Islands of Adventure, including shepherds pie, Rotisserie chicken and fish and chips! And you can get your pumpkin juice and ButterBeer here as well. You may even be entertained a bit as the innkeepers upstairs tend to “rattle” about while guests below are enjoying their meals. This is the Harry Potter theme park, after all. Listen for house elves and the like making a racket, upstairs. Note: Make sure to have the camera handy during your meal–the decor alone is worth some photo memories. 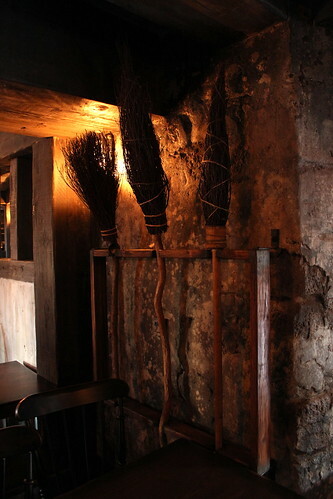 If you received a Three Broomsticks breakfast with your Harry Potter Vacation Package, try to reserve a time for after the Harry Potter theme park opens to the general public. You will want to enjoy your early hour at Islands of Adventure first. Good news: If you haven’t booked a Harry Potter Vacation Package, you CAN add a pre-reserved breakfast at Three Broomsticks on to your existing Universal Orlando Vacation Package. Just ask us how. Breakfast is the only meal that you can reserve in advance at Three Broomsticks. And if you are already using the Universal Meal Deal for lunch and dinner elsewhere in the park, this is a great way to take the planning out of breakfast and get a unique experience at the same time. Lunch and dinner are served on a walk-in only basis. Definitely try for dinner over lunch as the WWoHP is less crowded later in the day. I’m getting hungry just writing about this must-try restaurant at the Wizarding World of Harry Potter theme park.